Your weight - Who cares? Girls or boys, how can we help them feel good about their bodies? In a world where thinness and appearance are emphasized to extremes, how can we help girls and boys develop a healthy relationship with their bodies and with food? Written for parents as well as professionals, this book offers food for thought, tips and advice, interesting facts and many resources to get children to question the “models” imposed by society and develop healthy self-esteem. From an early age and throughout childhood, simple actions can be taken to break down sexual stereotypes imposed by certain games or clothes, encourage diversity, foster a healthy atmosphere at meals and instill respectful body-related attitudes and behaviours. The challenges of puberty and adolescence are also discussed and demystified. This book explains how to assist our children to navigate this period of transition more smoothly, while helping us to detect the potential signs of an eating disorder. Truly a survival guide at a time when “retouched” images are everywhere, this book encourages us to ask the right questions and take small practical actions that will have an enormous effect on our child's well-being. The book covers a long period, from early childhood to adolescence. It can be used both for prevention and for intervention. 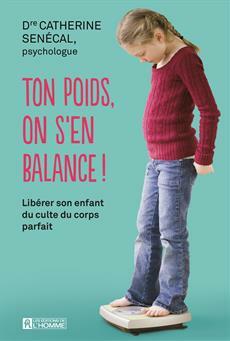 The subject of body image is not widely covered in French-language publications. The author has clinical experience with the people the book is written for; she knows what their needs are and relies on extensive experience. The book is designed in a dynamic way, with parents' questions, tips, and text inserts, all accompanied by illustrations.